Floridians risked their lives to rescue manatees trapped on the bottom of a suddenly dry bed of sand that just a few moments earlier was Sarasota Bay. Hurricane Irma succeeded in sucking all of the water out of the bay, leaving a few manatees stranded. In advance of Hurricane Irma’s approach to the Florida Gulf Coast, onshore winds pushed the water out of the bays leaving an eerie-looking expanse of puddled land where a choppy bay previously stood. The water moved out so fast that some of the bay’s manatees found themselves stranded on the land, Fox 13 reported. Groups of residents discovered the stranded mammals and quickly walked out to them and started a rescue effort. They recruited more help and managed to pull the manatees to deeper water. 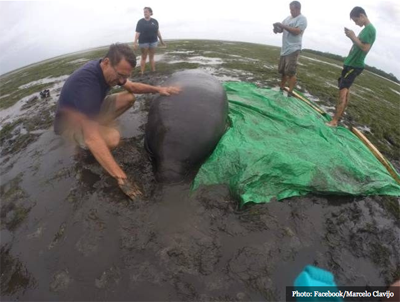 The video below shows the rescue of one of the sea cows in Sarasota Bay. Law enforcement officials joined in the rescue effort.